After years of wanting to attend I finally made it to comic con and it was quite an experience. I saw first hand previews of things to come in film. Had flashbacks with merchandise of my past. Plus, I learned how to be better prepared for the next con. 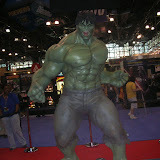 Comic con is a three day event dedicated to comics, film, TV and several other things in pop culture. It usually takes place in San Diego, California but for the past three years it has also taken place in New York City. After missing it last year I was not going to miss it this year. There were several things which I had planned to see but because of a busy schedule I was only able to catch the Saturday show. With so much too see I will just list my top five starting with number five. Frank Miller is bringing “The Spirit” from the pages of the comic to the big screen. He was also in attendance to talk about this project. Frank Miller is such a creative force in comics and it was great to finally see him in person. Also attending the show was Eva Mendez who stars in the film. After speaking about the film they introduced the world premiere of The Spirit Teaser Trailer. This was a short but sweet trailer. It didn’t show much but it definitely got me pumped for the movie that is to come. This guy is such a great director and his love for film shows in each one of his movies. The panel was a Q/A panel and he took time to answer in detail many of the questions asked. His future projects include “The Hobbit”. He will use his own filming technique as opposed to Peter Jackson to bring the book to life. In the hands of Del Toro, this film cannot go wrong. I got to meet the Hulk himself. He was at the showroom floor and I got to speak with him one on one. The guy is still built. Not as much as when he was at his prime but you can tell that he is constantly hitting the gym. He is a cool and down to earth guy and it was a privilege to meet him. It sure feels good to see things before they are even out in the public yet. This being the case, it was real cool to see the world premiere of The Dark Knight Trailer with a bunch of other fans. This wasn’t even on the schedule. It was a surprise from Christopher Nolan himself which was included in between The Hulk and Spirit Panels. The trailer was more plot driven than the first. It was followed by a well deserved applause. Amazing! I was not too excited about another Hulk movie being made but that all changed after attending this panel. The creators of the film plus actor Tim Roth were in attendance to answer any questions and give us several sneak peaks of the film. We first saw a rough edit of an action sequence. All I have to say is “WHOA”. This movie jumped instantly to my top films to see in 08 list. The scene involved The Hulk defending himself against several army troops plus an incredible showdown between him and Tim Roth’s character (Emil Blonsky). We then saw the world premiere of the second trailer which hits theaters in 2 weeks. Following this trailer was a super spoiler scene which blew me away. I can’t wait to hear the audiences reaction to this scene on opening day. There was also one more surprise at this panel which was an appearance by the original Hulk himself, Lou Ferrigno. The audience went wild when he came out. He spoke to the audience for a short while before he left the stage to head for the showroom floor. It was an excellent panel. There were a few things that I wanted to see but didn’t have the chance to. Here’s a list of a few misses. 4) Seth Green – Robot Chicken Panel. That’s all. Looking forward to next years con.